316 stainless steel.Recess flush to the deck for a clean look.Mounting styles: 4-hole counter-sunk f..
Closed base cleat black 6.5in Pack: BulkSize: 6-1/2" L x 1-7/32" HFastener: #12 (2).. Enhanced 316 stainless steel alloy. Four holes for required fasteners. Size: 6" L x 1-1/4" HFastener..
Made from long-lasting stainless steel. When transom mounted can function as a ski tow hook. Nut and.. Cast aluminum cleats. Ideal for small boats and docks. Two holes for required fasteners. Convenientl.. Enhanced 316 stainless steel alloy. Four holes for required fasteners. Size: 8" L x 1-1/2" HFastener.. Cast iron dock cleat with galvanized finish. Two holes for required fasteners. Pack: Skin packSize: .. 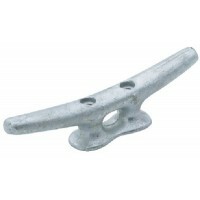 Cast iron dock cleat with galvanized finish. Two holes for required fasteners. Pack: BulkSize: 6" L .. 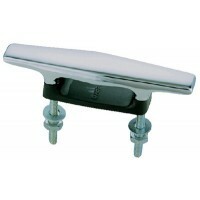 Cast iron dock cleat with galvanized finish. Two holes for required fasteners. Pack: BulkSize: 8" L .. Heavy duty, enhanced 316 stainless steel alloy. Four holes for required fasteners. Size: 8" L x 2" H.. Die cast zamak, Chrome finish. Predrilled for easy installation. Pack: 1 pr.Size: 4-1/2"Fastener: #8.. Die cast zamak, Chrome finish. Predrilled for easy installation. 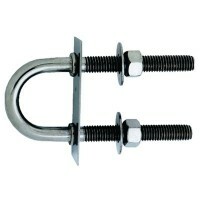 Pack: 1 pr.Size: 6"Fastener: #10..
A retractable stainless steel cleat with a thin profile that installs easily. Spring loaded stay up ..
Die-cast zamak with perma-plate chrome finish. Includes cadmium plated shanks, nuts and washers. 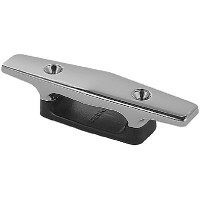 Ins..
Nylon coated aluminum cleat with stainless bracket & clamp. Mounts to 7/8" & 1" diameter. Use for fe..
A convenient way to temporarily tie up boat. Made of heavy-duty steel and tested to hold even in wav..
Where safety is a concern this cleat folds down to a low profile base and conveniently flips up for .. Traditional, cast iron, hot dipped galvanized dock cleats. Recessed mounting holes with a hexagonal .. Cast from solid polished aluminum. Size: 8-1/2".. These cast aluminum cleats are sand blasted to give a clean Gray matte finish. Each cleat is designe..
Injection molded high density polyethylene and U.V. stabilized. Black. Length: 6"..
Injection molded high density polyethylene and U.V. stabilized. Black. Length: 8".. These cast aluminum cleats are sand blasted to give a clean grey matte finish. Each cleat is designe..
One-piece, spring-operated, portable mooring ring. 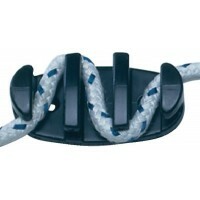 Tie to the end of mooring lines and never forget ..
Strong yet lightweight, cast aluminum. Features a bright, white, polyester poly coat finish and stai..
Dock cleat you can take along! 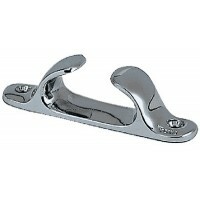 Easy to store and use, powder coated cleat with rope ring fits in bet..
Chrome plated zinc alloy. Pack: 2Base: 2-3/16" x 1-1/8"Fastener: 6"Line Size: Up To 5/16"Length: 2"..
Chrome plated bronze. 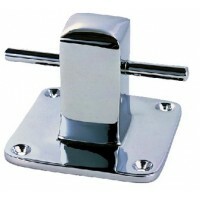 Size: 4" L x 7/8" WFastener: #8Fits: 3/4" Line..
Chrome plated zinc alloy, plastic base. Pack: 2Fastener: #10Line Size: Up To 3/8"Length: 4-1/2"..
Chrome plated zinc alloy with a Black plastic base. 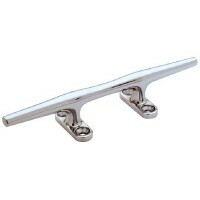 Pack: 2Fastener: #10Line Size: Up To 3/8"Length:..
Chrome plated zinc, plastic base. Stainless steel studs, nuts and washers. Stud: 12-24" x 1-1/2"Line.. Hollow chrome plated bronze. Base: 4-1/4" sq.Fastener: 1/4"Height: 3-1/2".. Hollow chrome plated bronze. Base: 5" sq.Fastener: 3/8"Height: 4-3/4"..